Do you shop at amazon.com? You can now donate to NAMI Cook County North Suburban every time you make a purchase with amazon. Click through for the link, choose NAMI CCNS, and thank you! AmazonSmile (smile.amazon.com) is a website operated by Amazon that lets customers enjoy the same wide selection of products, low prices, and convenient shipping features as on Amazon.com. The difference is that when customers shop at smile.amazon.com, the AmazonSmile Foundation donates 0.5% of the purchase price eligible items to the charitable organizations selected by customers. You can donate while you shop for others at smile.amazon.com. Support us when you shop on amazon. 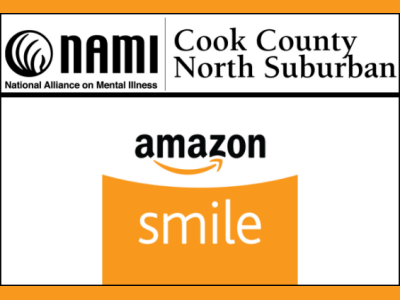 #StartWithaSmile at smile.amazon.com/ch/36-3714540 and Amazon donates to NAMI Cook County North Suburban.